The great thing about wordpress or any other decent blogging engine is that it gathers stats. Stats on visits, stats on click thru’s but most important and most interesting is the stats on referrers ! This can be search engine terms, I’m sorry to say that I have no interesting search referrers like Rory but the Silverlight posts have lead me to an interesting site and better still he has a link to mine ! 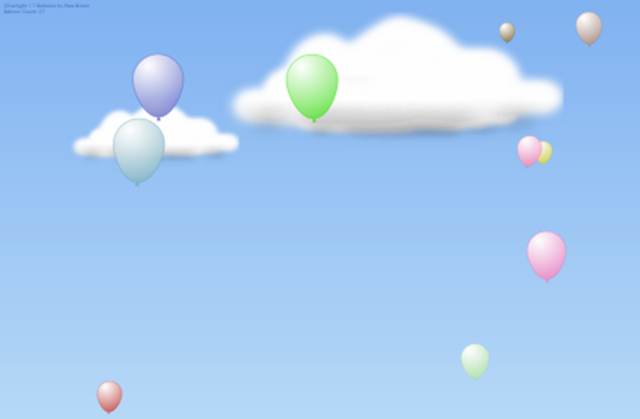 Pete Brown has a lovely example of Silverlight animation that’s just so pretty called balloons. Can you tell what it is yet ? This is done in Silverlight 1.1 and he goes into detail on some of the problems he has had in creating this and what things are lacking in Alpha. So take a look at this and his other posts all are pretty interesting, I know I will.